Check if the amount of work assigned to your iteration exceeds the total capacity of your team. The capacity view highlights the overbooked portion in red. This is handy when you're planning your sprint on your agile board, and you don't realize your team is already overbooked with work. See if there are people on your team who are already overbooked. The capacity view shows the capacity per person, so you can see if and when overall capacity isn't balanced. Determine if you have excess capacity. If so, you might decide to add more work to your upcoming iteration or start a new project. Go to your plan and select the Capacity view from the drop-down next to Calculate. Click on an iteration to see capacity details. Free capacity Amount of free capacity after usage. Planned capacity Original planned capacity. Capacity utilization Current percentage of capacity that is being used. This section explains the key elements of the capacity view. 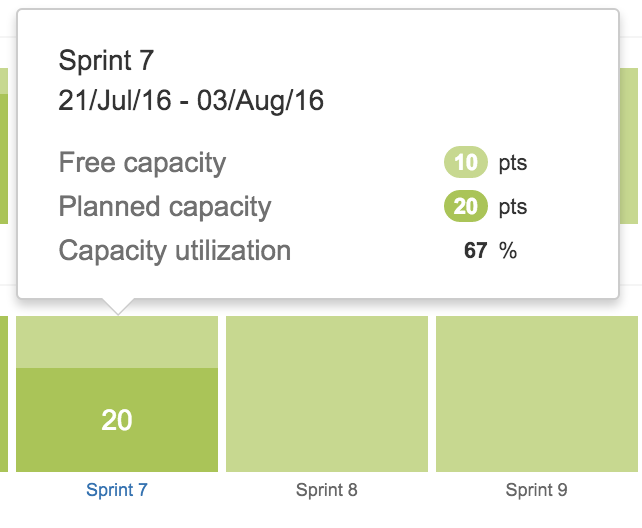 The capacity view shows key capacity information for teams and team members on an iteration by iteration basis. Team name label: Name of the team the capacity view is referring to (will only show when viewing capacity view using "team " grouping set by the user in the capacity view settings). Overbooked capacity indicator: ‌Indicates the overbooked capacity for the iteration. This is displayed in red on the capacity bar. Click anywhere on the capacity bar for an exact breakdown of planned capacity, free capacity, overbooked capacity, and capacity utilization. Iteration name label: The name of the iteration the capacity bar relates to. Numerical planned capacity indicator: Shows the amount of capacity planned for the iteration period. This value only appears when there's enough room on the capacity bar. Click anywhere on the bar for a breakdown of planned, free, and overbooked capacity, along with capacity utilization. Free capacity indicator: Indicates the free capacity for the iteration. This is displayed in light green on the capacity bar. Click anywhere on the capacity bar for an exact breakdown of planned capacity, free capacity, overbooked capacity, and capacity utilization. Portfolio tries to schedule work as early as possible without violating the capacity limit of the resources. The Scheduling algorithm assigns work, taking into account team members' weekly availability and the amount of work to be completed. You can configure the capacity in step 4 of the plan creation, or by going to the Team section and configuring the team members availability and capacity. If you don't add team members' availability or specify the team capacity, Portfolio will still calculate the capacity by adding a default capacity of 200.